Like it or not, it certainly has been a real winter this year and I’m burning through lots of firewood. Most of us have had a bit of snow and ice and my poor backyard thermometer has been as low as 10 and 14 degrees. This of course means goodbye to certain tender tropicals (like my Meyer lemon) but hello to new planting opportunities which I most thoroughly enjoy. Most artists only get to paint their paintings once, but we landscapers get to constantly touch ours up, alter their interpretation, or repaint them all together. After all, one of the reasons I got into horticulture was because it was half science and half art. I enjoy science but truly love art. 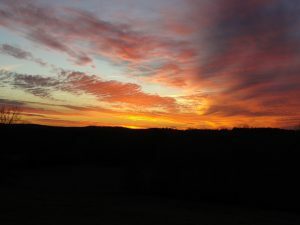 The beautiful sunsets in January picked up where the fiery ones left off in December. But whereas they started the month off in angry reds and oranges, they gradually progressed to numerous shades of Monet-like corals and pinks toward the end. I don’t know what’s causing them but I hope they keep it up. My parent’s west facing house on a 500 foot hill just up the road makes for the perfect vantage point. We started having our Theresa and Les Reeves SFA Gardens lecture series on the second Thursday of the month in January instead of the traditional third that we had used for a decade. I figured the attendance would be down but The Arbor Gate’s own Jason McKenzie drew a crowd of one hundred interested gardeners to his lecture on “Making a Texas Cottage Garden.” In February we will start having them in our new Ina Brundrett Conservation Education Center at the Pineywoods Native Plant Center on the campus of Stephen F. Austin State University where I hang my hat. We dedicated the new building in January which in addition to hosting our lecture series each month will be used for our environmental education programs that reached 15,000 school children last year. 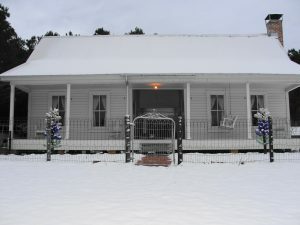 On the cold evening of January 23 I was greeted with light rain as I left work in Nacogdoches, then sleet as I headed north towards Garrison, and then the most beautiful snow as I headed towards Arcadia. It only snowed for a few hours (several inches) but the large flakes made for a beautiful sight the next morning. I even got out the blower the next morning to clear my dogtrot porch only to find the light layer of ice below more dangerous than the snow. Frozen pipes and treacherous porches are a curse of old pier and beam houses. I headed in to work on dangerous roads to check on my greenhouse and nursery before heading out on a somewhat ill-fated trip to visit an old friend in Baton Rouge. Since the storm was headed east I studied the forecast on intellicast.com and weather.com to make sure the frozen precipitation would be gone and the temperatures warmer by the time I arrive late that afternoon. Unfortunately the trip turned out to be a nightmare as the precipitation did not move out and the temperature never got above 28 degrees in South Louisiana all day. This meant all interstates and many bridges were closed. Not surprisingly there’s a bridge every step of the way down there! My 5 hour trip turned into a 10 hour trip but miraculously I survived by traversing unfamiliar routes without the help of a map or satellite guidance system. Luckily I always enjoy the scenery even which I’m about to die! 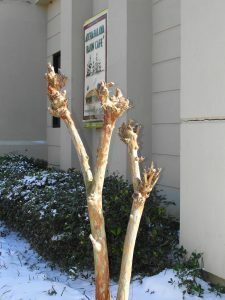 The state of Louisiana used to seem immune to the hideous pruning effects of crapemurder but I was depressed to notice the practice is now quite common there as well. I just don’t understand why folks want to disfigure such a naturally beautifully shaped tree. Especially since not one expert, book, or article in the entire world suggests doing so. To each his own I suppose. It does show how many folks don’t read though. I did very much enjoy my trip as my friend taught me how to make her grandmother’s delicious Cajun gumbo and I picked up Louisiana delicacies like satsumas, dark roux, smoked tasso, pork sausage, and boudin on the way home. I make gumbo periodically but I couldn’t help but notice it didn’t taste like hers. I can’t wait to make it again! Many of my vegetables are frozen (or in intensive care) but my large patch of greens continues to survive. This means boiled turnips, mashed turnips, and roasted turnips will be on the menu through spring. My fall planted snow peas froze but I have replacements in the greenhouse ready to set out along with red flowered heavenly scented sweet peas to go on my front fence. Though I’m not very fond of winter it does stimulate hope, anticipation, and excitement for the coming spring. In January I received a snappy new sign and certificate noting that I was selected as a Certified Forest Steward by the Texas A&M Forest Service for work I have completed on my rural woodland property. The Certified Forest Steward program was created to identify and recognize landowners that have implemented key portions of their Forest Stewardship management plan within the past five years. 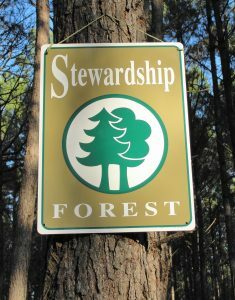 The U.S. Forest Service established this program to recognize landowners that manage their land according to sound stewardship principles. Nature and wildlife are my greatest joys and I truly welcome the opportunity to look after them. I actually feel obligated. It’s the least I can do considering how much happiness nature provides me. January also saw the start of the Voices from Small Places: Arcadia project. It’s a pilot project conducted by the Center for Regional Heritage Research and the East Texas Research Center both located on the campus of Stephen F. Austin State University in historic Nacogdoches. The goal of the project is to document and preserve the history of small places (population under 100) in East Texas. It’s been a lifetime goal of mine to preserve the history of my little ancestral hamlet for future generations and I’m certainly looking forward to it. I was disappointed to learn the SFA Gardens lecture series will now meet on the 2nd Thursday of the month. 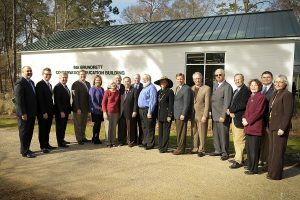 The Pineywoods Beekeepers Association meets on the 2nd Thursday of the month. I can't be in two places at once!